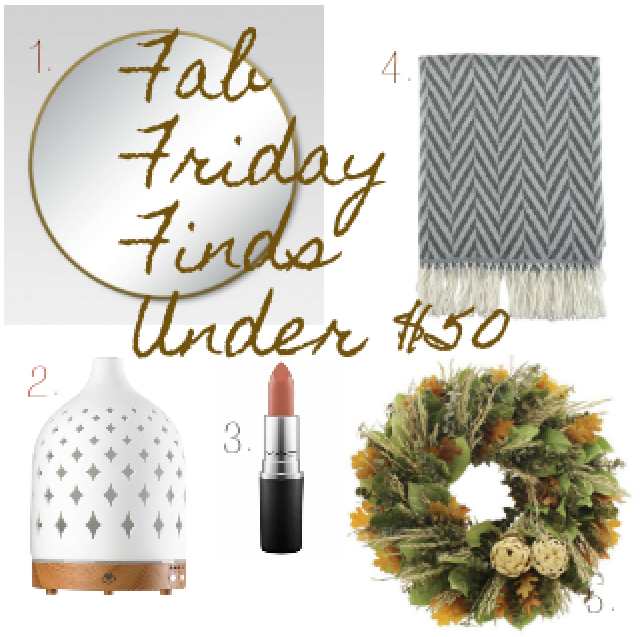 I am so excited to introduce you to a new series I will be doing called Fab Friday Finds! I will be including this segment weekly to highlight things I have found around the web to be lovely and irresistible. Encompassed in that will be decor, fashion, style and beauty. I am so excited to start this week’s segment with these beauties I have found and love. And they just happen to all be under $50!! In this series there will be some things I have, some that I want and some I just want to share because I think they are so fab! Enjoy!! 1 // Mirror, mirror, on the wall….you are the best looking thing I’ve seen in a while! I love the modern look of this mirror but I also think that it is very versatile and would go with different decorating styles. It is a good size and I love the brass detail. Great price point! 2 // Diffuser In an earlier post about my Top Ten Favorite Household Helpers, I mentioned just how much I love my diffuser and essential oils. I found this beautiful diffuser that not only gets the job done, but looks amazing in any home. I would love this since I diffuse daily in my kitchen and it is really pleasing to the eye. Love the natural wood tone and the fact that it lights up and has a timer. It’s on sale this right now! 3 // Lipstick Hands down the best lipstick I have found. I was looking for a basic lipstick for the Fall that I could wear with anything and could carry me through Winter. I found this color and went to try it on. PERFECT. I bought a lip liner to match. It is Matte Lipstick by Mac in Taupe. LOVE LOVE LOVE It looks good on anyone. My friend bought it, too, and it looks great on her, it looks great on me….it goes well with any skin tone. Did I mention it’s PERFECT? 4 // Blanket This blanket is so soft! It’s in my cart and I am ready to press “purchase”. It’s not too thick and not too thin…it’s just right! Let’s call it the Goldie Locks of throws. And it’s on sale this week! 5 // Wreath I love a beautiful wreath adorning my front door no matter what season it is. A beautiful wreath is inviting and adds a touch of warmth to the front of the home, welcoming all who enter. I love this one for the Fall because of its beautiful hues and who doesn’t love artichokes as a design element? I hope you have a GREAT weekend! So many fun Fall festivities happening around you. Get outside and enjoy a fun pumpkin or apple farm. Don’t miss these days….you’re going to miss this!